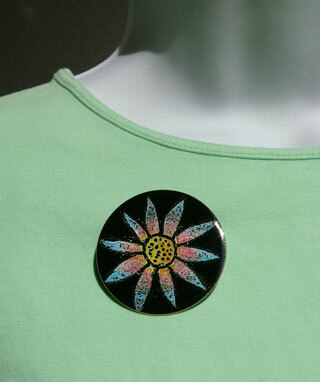 A circular brooch with a colourful daisy design, available in two sizes, and in a range of colours. "My circular Daisy Brooch is one of a range of three flower-themed designs and has a colourful, bold flowerhead design. I make it in a range of bright or more subdued colours against a black background. Although the motif is essentially the same for each Daisy brooch I make, the design is created in the final layer of enamel. This means every one is a unique piece, with differences occuring due to the nature of the handmaking process. Whatever the time of year & whether you are looking forward to Summer or remembering those gone past, this brooch can brighten up a winter coat or make a statement on a favourite jacket in the warmer months. The two sizes available are large 50mm diameter and small 40mm diameter. The Daisy brooch, which is presented in a gift box has a silver-plated brooch fitting."